Artemisia californica 'Canyon Gray' (Coastal Sagebrush) is a prostrate form of Artemisia californica from the Channel Islands. 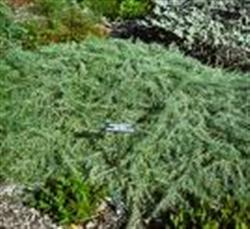 This large scale groundcover remains under 2 feet tall and forms a compact mat of fine textured silver-gray foliage to 10 feet wide. Works well on dry slopes, draping over walls and the foliage is very aromatic when crushed. The flowers are fairly inconspicuous. Plant in full sun in a soil with good drainage. Little irrigation is required. Hardy to about 20-25° F . This plant was found growing in a windswept area on San Miguel Island by Ralph Philbrick, former director of Santa Barbara Botanic Garden. It's best if it is mowed or heavily trimmed every 1 or 2 years.